Bonjour from Paris with an update: after one whole week of unsuccessfully searching for my sartorial groove, I'm officially reporting this: I'm in a clothing funk! Today, I gravitated yet again to black and white (black top, white pants) before realizing this has to stop! So I kept the outfit on, pulled three scarves from my suitcase, and decided to add a little bit of excitement by way of adding said scarves to said pants. Look 1: I folded and wrapped a vintage Chinese hand embroidered throw around my waist. Doesn't any kind of fringe make everything better? Look 2: Here, I added a vintage Yves Saint Laurent striped silk shawl that came with a matching dress I bought from a sweet little shop in the East Village. I haven't worn the dress yet, but I find myself wearing this ruffled wonder of a scarf all the time. Look 3: Finally, I made a train out of a vintage Egyptian woven fabric known as an Assuit, handmade in the early 1930s. 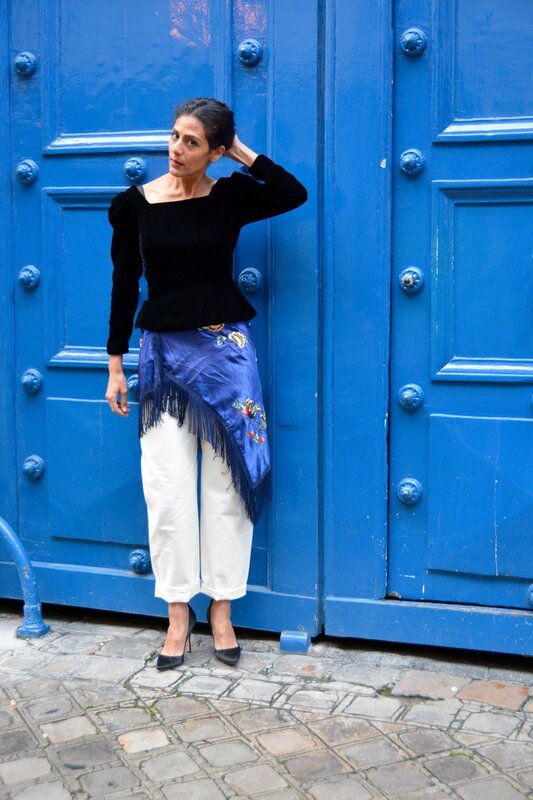 Wearing vintage velvet top from Etsy (similar here); pants: Lemaire (similar here); satin pumps: Manolo Blahnik; random wall I stumbled upon that served the perfect complement to this outfit: corner of Rue Jacob and Rue de Verneuil!